Whether you just getting into craft beer, or are an old pro on the scene, you’ll need the best beer growler to keep all your brews in. Growlers can help you get those special beers that are only on tap at the brewery or in certain places and share them with your friends or keep them all for yourself. Many breweries and taprooms, however, use disposable growlers that don’t keep your beer fresh for more than a few days. Search through our list for the best growlers around. Capacity: How much the growler holds can be really important to craft beer lovers. Too much, and you can’t finish all the beer before it goes flat. Too little, and you’re constantly running back to the brewery. Consider how much you typically drink before choosing a good capacity. Material: Many of the best growlers are made of stainless steel, but some can be made of ceramic or glass. Typically, stainless steel is a good choice because it keeps your beer cool and fresh, but well built ceramic and glass models can be really great as well. Insulated: An insulated growler keeps your beer icy cold for a much longer time than uninsulated ones. 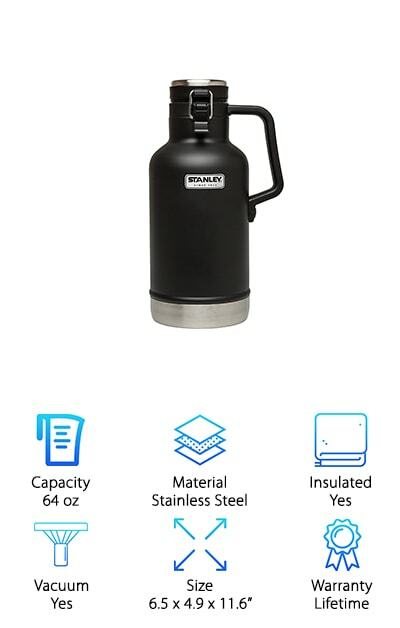 If you’re looking to take your beer to parties, barbecues, or even camping, an insulated growler is definitely the way to go. Vacuum: A vacuum seal helps keep your beer fresh and carbonated for a much longer time than a normal seal. Typically, breweries will give you a glass growler with a screw on cap and you’re lucky if it keeps for more than a couple of days. A vacuum seal solves this problem. Size: If you’re going to transport your growler frequently, you may want to consider it’s size. A large growler could get in the way of carrying it frequently, but if you want it to hold a lot of your favorite brew, this may not be an issue. Warranty: Some growlers come with a warranty. Typically a warranty is a manufacturer telling you they are very confident in the quality of their product, so purchasing something with a warranty can be a great long-term investment. So now that you know what to look for in the best beer growlers, let’s get straight to our amazing growler guide. If you’re in a rush to get to your favorite brewery and fill up, check out our top and budget picks. They’re both amazing examples of great growlers at a great price. If you want to do your due diligence, read all the way through to the end to see all of our amazing picks. Cheers! 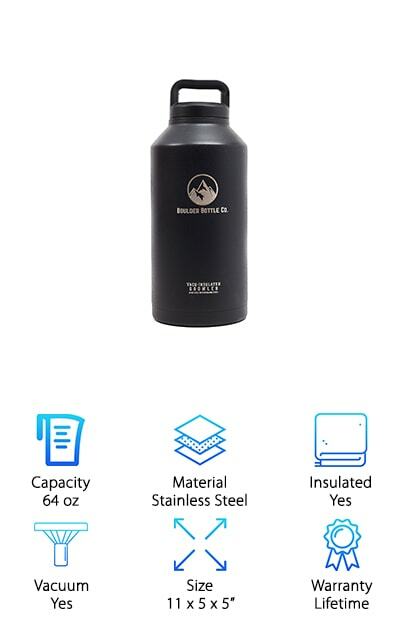 If you want to make sure your beer stays chilly no matter where you take it, you need the best insulated growler out there. Our top pick is an amazing growler that comes in seven fun colors and can keep your beer cold all day long. The colors are- black, citron, graphite, mint, pacific, stainless, and white. It has double-walled and vacuum insulated TempShield technology that allows it to keep your beer cold for longer. The Carry System cap keeps it nice and carbonated so you’ll never have to worry about your beer going flat after just a few hours. The growler is made of non-toxic BPA-free plastic and food grade stainless steel, so it’s safe to use. It even comes with a proprietary powder coat, giving it it’s unique colors and keeping it from slipping out of your hands. This is a great choice for anyone looking for an amazing growler that stands out from the crowd. Our budget pick is a great choice for beer drinkers on the go. It even comes with a carrying case so you can take your beer to a friends house, a party, or on a camping trip. This growler has a vacuum insulated design that keeps your beer as fresh as when you left the store. It comes in five fun colors that stand out from the crowd- black, cayman blue, celeste green, lime green, and stone gray. Their growler even comes with the standard government alcohol warning on the bottom, so you’ll never be turned away from shops that require this of their growlers. This growler holds 64 oz, enough to get the whole party in on the fun. This growler comes with a lifetime warranty, so you can be confident that it will last you a long time. It even has a sturdy powder coat finish to keep it from sweating. This is a great choice for budget beer drinkers on the go. This growler is a great choice for anyone who needs something sturdy and able to stand up to anything. This growler is not only a great choice for beer, but for people who need something to take camping or into the great outdoors. It can keep beer cold, coffee hot, or anything else you can think to put in it. It has vacuum insulation to keep your beer cold and crisp. The handle makes it easy to pour with one hand, so it’s easy to pour a glass for friend or yourself. This growler is specifically made to have no plastic contact, which can taint the taste of your beer. With this growler, you’ll always taste the fresh and crisp brews as intended. 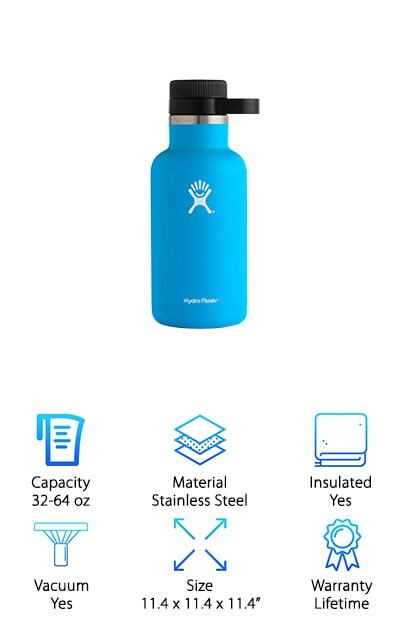 It’s also dishwasher safe, so it’s easy to clean and use for coffee, beer, or any other beverage you could want. Stanley also provides a lifetime warranty, which allows you to buy with confidence. Ever wished you could just take a keg with you everywhere? This is the growler for you. 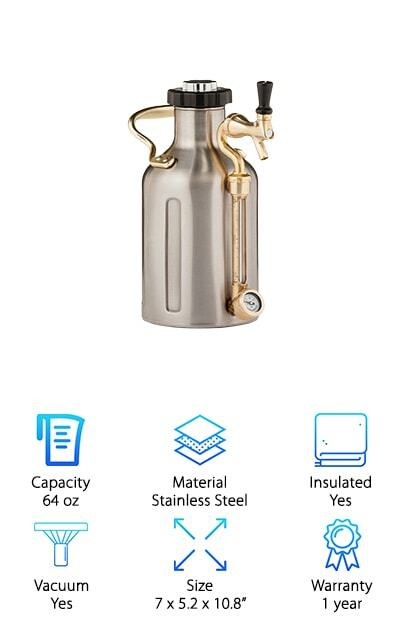 Certainly the best pressurized growler, this amazing growler allows you to not only keep your brews cold and fresh but also allows you to tap your beer straight from the growler. This allows it to keep beer fresh and carbonated for an astonishing two weeks. This allows you to keep the party going and keep your beer fresh no matter what comes your way. It even includes a variable pressure regulation cap, which helps it maintain perfect carbonation every time. It even comes with a one year warranty and lifetime customer support in case anything goes wrong with your growler. With vacuum insulated stainless steel, it keeps your brews fresh and cool all day long. If you’re a home brewer, you can even use this growler to force carbonated your own brews. This makes it a great choice for any homebrewers who love to share their creations with friends. 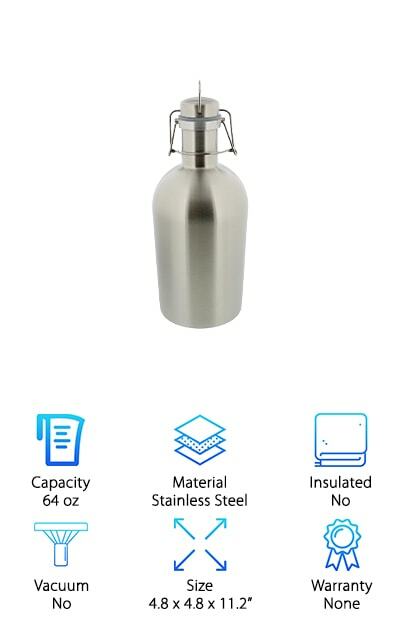 This awesome vacuum insulated growler by Boulder Bottle Co. is a great choice for people who need a super strong growler. With a thick gauge stainless steel exterior, this growler can stand up to any task. It keeps your beer cold without affecting its flavor, ensuring that you always taste it as the brewer intended. It can keep your beer cold for up to 24 hours from the original moment of bottling, which makes it a great choice for beer lovers on the go. It even comes with a lifetime happiness guarantee against manufacturer defects, which makes sure that you always have the best experience with your growler. It has a wide mouth for easy pouring and can hold up to 64 oz of your favorite beer. It also includes a powder coat to keep it from sweating and allow you to grip it easily. It doesn’t include any plastic liners, making sure the flavor of your beer is never compromised. 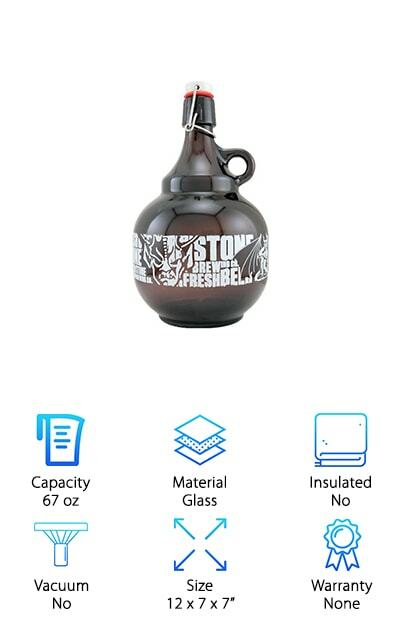 This unique looking growler is a great choice for anyone who wants something that’s sure to be the topic of conversation at every party. It’s made of glass, so it is sure to keep your beer fresh without tainting its flavor. The old-fashioned jug design makes it easy to hold and pour. The swing top cap keeps your beer fresh and carbonated and is similar to the growlers most taprooms use. It also ensures that you’ll never have to worry about your rogue cap going missing. This is a great choice as a gift to any beer lover who wants to expand their growler collection. It is sure to be something unique that they don’t already have. It is a great conversation topic and the shape alludes to something potent and mysterious brewing inside. The gargoyles printed on the growler help to protect your precious brew. This is a great choice for anyone looking for a unique growler. 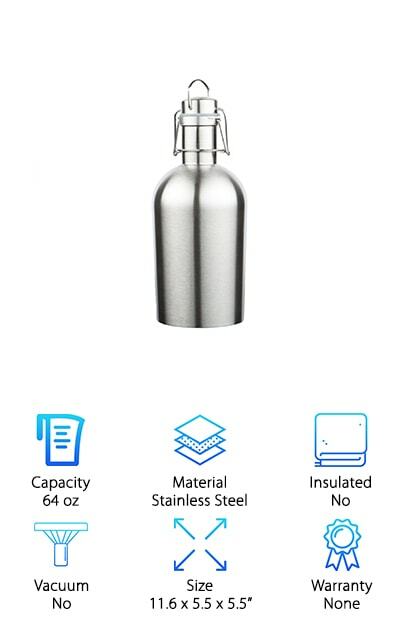 This insulated stainless steel growler is the perfect choice for drinkers who just want to stick to the basics. The stainless steel exterior helps to lock in freshness and keep everything the way it was when you picked it up from the brewery. This growler comes with a flat top lid that is equipped with a silicone gasket to ensure carbonation retention. This growler is perfect for people looking for something simple and elegant. The single wall construction makes it a perfect choice for people looking for a great budget choice that still keeps your beer crisp and cool. 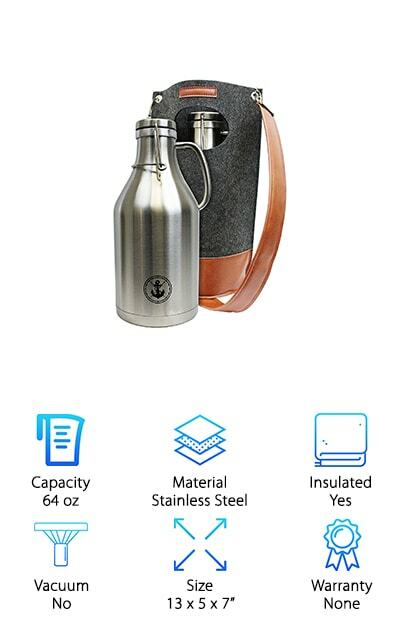 This also keeps it lightweight and makes it easy to carry to any party you may be attending, or anywhere else you may need to take your fresh brew. The lid locks tight to keep everything safe, carbonated and prevents any spills along the way. This is a great way for beginner craft enthusiasts to keep their beer safe and fresh. This is a great pick for anyone who wants to carry their craft brews in style. This amazing growler comes with a cool wool carrying case that can help you take your craft brews wherever you go. The case even has an opening in the top that allows you to pour your brews straight from the carrying case. This makes it perfect for BBQs and parties, keeping your brew the center of attention. It keeps everything ice cold for up to 24 hours, so you'll always have a cold brew on hand. The flip-top lid makes it easy to pour without sacrificing quality or style. It allows you to give a fresh and foam free pour every time. This growler even has the surgeon general’s warning printed on it, so you’ll never have to worry about being turned away from shops who require this warning on the growler. This is a great pick for any craft drinkers with style. If you’re shopping for the serious craft connoisseur, this is the growler for them. This is the ultimate craft contraption, perfect for people who love getting growlers of new and delicious craft beers and sharing them with friends. It keeps a full gallon of craft beer carbonated and fresh. It keeps beer cold all day and includes its own tap for ultimate freshness. The automatic regulator cap allows you to keep beer fresh for a long time. Though it is not as old school as a ceramic beer growler, it has a wonderful vintage style. It is a beautiful piece to have on your home bar and definitely a great conversation piece. The included keg allows you to get a pint without cracking the vacuum seal on your entire growler. This allows you to always taste your beer as the brewer intended as if you were tasting it at the brewery itself. This growler is perfect for anyone who’s just getting started on their growler collection and needs something simple and easy to use. 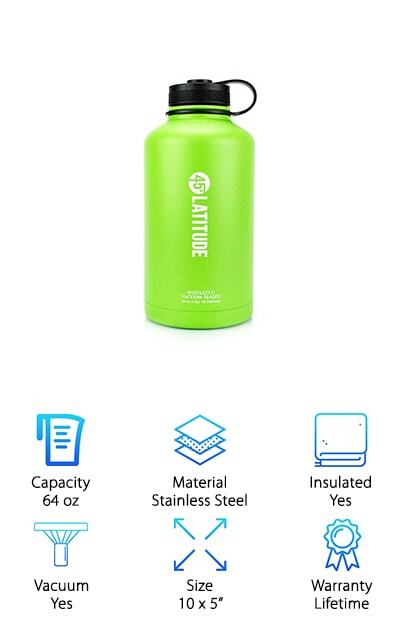 It holds up to 64 ounces of any connoisseurs favorite brew. The simple flip top design keeps everything fresh while being easy to open. It’s also easy to keep track of, so you’ll never lose the cap after one too many. The stainless steel construction keeps your brews colder for longer than some other materials. This container is easy to carry, so you’ll never have issues transporting it from party to party and everyone can enjoy craft brews. If you just want to keep it for yourself, the cap keeps everything fresh with its airtight seal. This growler is constructed with BPA free materials, so you won’t have to worry about changes in taste or quality. The fold-down handle helps you carry it around easily, and quickly stow it away when you’re not using it.